While the smartphone may have taken over many areas of our lives, there are still people who prefer the class and elegance of an automatic watch with a watch winder. If you are one of those people, then congratulations. You managed to keep a piece of history alive. However, the battle is not over. You still need to find a winder that’s accurate, stylish, affordable, and with settings galore. The watch market is small and niche, but that doesn’t mean you won’t find what you’re looking for. Whether you’re after a contemporary or classic winder, you are sure to find the perfect one for your needs. Check out these nine options below, then factor in the many considerations for making the best winder purchase. 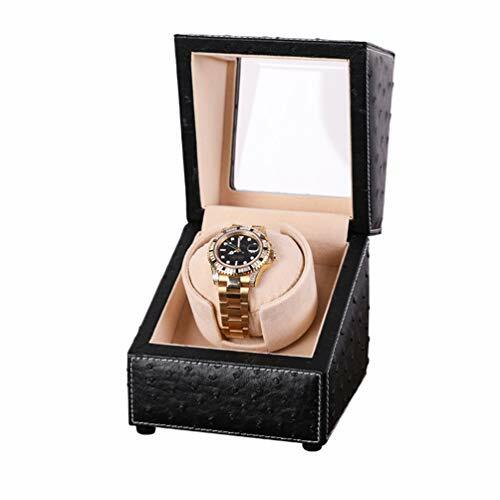 If you are looking for a single watch winder to make sure your watch is as accurate as possible when not on your wrist, look no further than this one from CHIYODA. Elegant, classy, and full of surprises, it’s everything you could need and more. What most people love about this watch winder is that you don’t have to plug it into the wall outlet. While it can run on AC power, you can also power it with two AA batteries. As a result, it can go with you everywhere. It’s also available in three colors – brown, black, and ebony, and is complete with a piano bake varnish, organic acrylic glass, and high-gloss lacquer. It looks exquisite in any setting. It’s handmade for that custom look, while also being compact at five inches in diameter. It also comes with an 80mm pillow, 12 rotation modes, three directional settings, and an 18-month warranty. 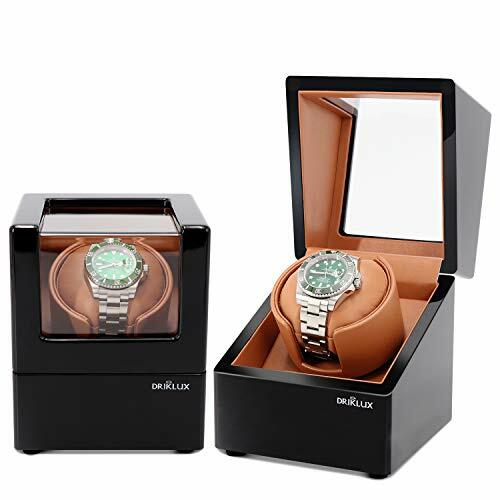 If you ow an automatic watch which requires you to wear it to keep the moving weight and internal components operational, then you need this watch winder. It’s sleek, stylish, and suitable for your every need. If you pride yourself on your exquisite watch collection, then it’s not complete without this JQUEEN watch winder. With space for four watches and an abundance of settings, it will meet the mark for many people looking to ensure their wristwatches remain in working order. However, it’s not just a functional device, but one made lovingly as well. It’s handmade with copper fittings, four turntables, acrylic glass, and piano lacquer. It ties in beautifully with most home décor and even has PU watch pillows to fit four watches at any one time. What people will also enjoy is the dual power supply. You can run it on batteries when you’re away from home or during a power cut, or you can use the AC power supply. The sky’s the limit. When it comes to functionality, this winder stands out in a league of its own. It offers three direction settings of alternating, clockwise, and anti-clockwise, while also providing a multiple TPD (turn per day) setting tool. Then, you can use the four program modes to make sure your watches are turning at the correct pace. The motor is quiet, the design is sleek, and the 20-centimeter size makes it more than suitable for homes use. When the time comes to update to a watch winding unit that takes care of not one but four watches, check out this one from JQUEEN. 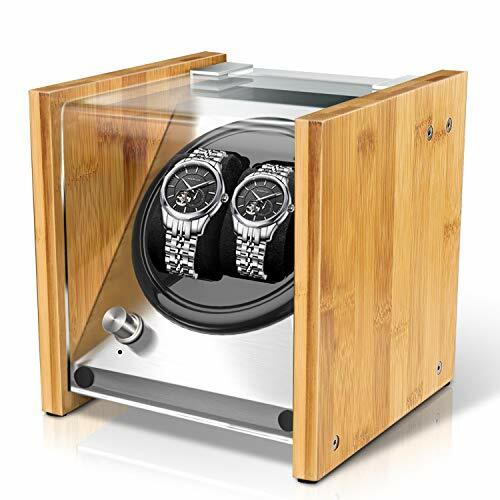 While there is an abundance of sleek and elegant wood watch winder types on the market, there are very few contemporary ones. Not everyone wants a classic style watch winding unit – especially if their watch is more modern. Therefore, Versa has plugged the gap in the market for a single watch winder of the future. It’s bulbous with a sleek and contemporary design and striking black color schemes. For those who prefer cutting-edge technology, this winder will tick all the boxes. It’s suitable for one watch and offers exceptional timing thanks to the Mabuchi motor and gearbox. It’s quiet, suits most home décor, and was hand-assembled for premium quality as well. What’s more, the functions on offer will impress. You can benefit from the four TPD setting, three direction settings of alternating, clockwise, and anti-clockwise, as well as 12 setting combinations. In essence, it offers everything you need to keep your watch running at its best. However, the benefits don’t end there. It features a spring-action pillow, a five-minute turning time, and even comes with a power adaptor and a one-year warranty. If you want the best of the best with your next winder, don’t look past this one from Versa. It’s bound to impress. There is a lot to love about this Versa watch winder, and very little not to like. While it might not suit every automatic watch owner, it’s going to meet the mark for style, functionality, and durability. The first noteworthy point is the style. With four “bubbles” for watches, it’s a sleek and contemporary winder that looks every bit the picture of perfection. No matter where in your home you put it, it will look like a piece of art as opposed to a functional unit for winding watches. It’s also mostly plastic which, for some people, could be a positive or negative attribute. Regarding settings, this watch winding unit offers many. You can wind your wristwatches anti-clockwise, clockwise, or even bi-directional. It also has four TPD settings, a five-minute turn time, and independent controls for each. Therefore, you can choose custom settings for each of your wristwatches. This watch winding unit comes with spring-action pillows, adaptors for larger watches, a power adaptor, and a one-year warranty. Therefore, you will find it more than meets the mark for your watch winding requirements. 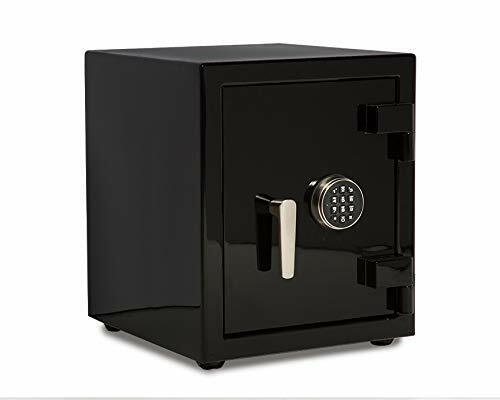 If you are tired of buying one watch winder after another and having them die quickly and without warning, then it might be time to extend your budget. If you pay a little more, you can purchase this sleek, stylish, and high-end WOLF double watch winding unit for two wristwatches. While it is around four times more expensive than other watch winding unit on the market, you get what you pay for – exceptional quality. Most winders on the market estimate and guess the rotations which means it’s not always accurate. This one, however, has patented innovations which suggest that every rotation is exact. It turns 900 times per day with three directional settings on offer, and will also suit all watches up to 52m. With this watch winder, you will also appreciate the high-quality chrome hardware, locked-in and secure cuff, heritage styling, and the dual power supply of battery or AC. It also comes with a two-year warranty whereas most others only come with one year. Even if you never intended on spending a few hundred dollars on a watch winder, this one will show you immediately that it’s worth it. If you want only the best when it comes to both your watch and your watch winder, then set your sights on this unit from Heiden. Even though you need to spend a little more than average on this watch winder, you will be pleased you did. It’s everything you need it to be and more. Firstly, the finish of this winder is exquisite. It features walnut wood, spring-action pillows in an elegant style, and beautiful styling to seal the deal. What’s more, it’s a little larger than most other winders because none of the watches touch – something that’s a necessity but many manufacturers don’t offer. When it comes to functionality, there’s no denying Heiden ticks all the boxes here too. You can select from three direction settings of bi-directional, anti-clockwise, and clockwise, as well as easy-to-use settings for TPD as well. Then, if you want to turn the winder off, you don’t need to reach in the back. Instead, there is a convenient push button that enables you to turn it both on and off. While the warranty of one year isn’t generous when you compare it to the price tag, you are bound to enjoy every feature this watch winder has to offer. It’s worth its weight in gold. If you want to buy a high-quality watch winder, you may think you need to spend hundreds of dollars. While in many cases you do get the best of the best when you spend a little more, that’s not the case with this one. 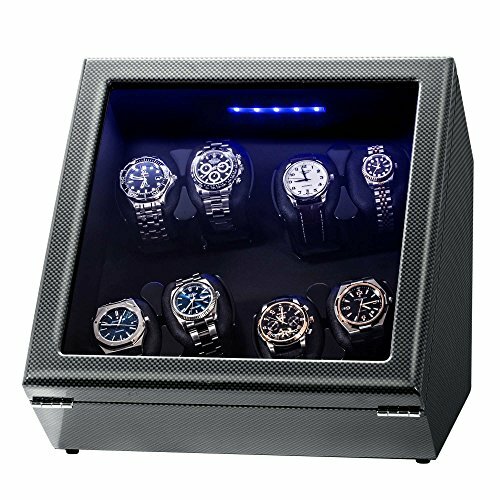 For a fraction of the price of other watch winders, you get this exceptionally durable, stylish, and unique Diplomat Roadster watch winder. It’s suitable for two watches, offers 12 winding combinations, four TPD settings and three direction settings. When you put two wristwatches in it, you also benefit from knowing there is plenty of space for them and they won’t touch. While there is minimal support for the wristwatches in the back, it’s a small price to pay for what is ultimately an exceptional unit. 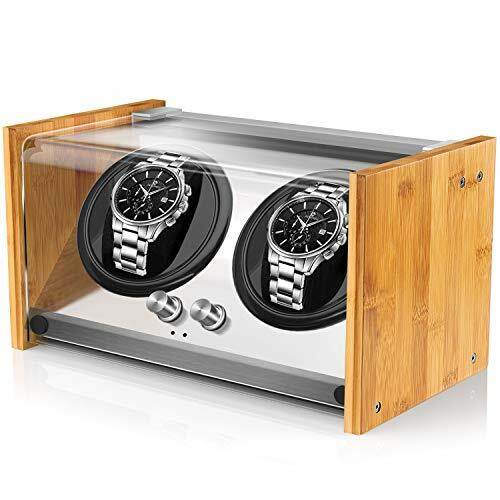 Functionality aside, the style of this wood watch winder will also impress. It has a high gloss, burl wood finish and sits looking sleek and stylish in any space. Rather than spend hundreds of dollars, get the same value and finish from Diplomat at a fraction of the price. If you don’t want to take up a lot of space on your dresser with a big, bulky watch winder, then take a look at this Olymbros unit. With space for two watches but only six by seven inches, it’s undoubtedly going to tick all the boxes for your needs. It can sit in a corner on your dresser out of sight and out of mind, or take pride of place – it’s up to you. When you consider purchasing this watch winder, you can choose from three colors – red and yellow, black, and red and apricot. The black watch winder is sleek and contemporary with carbon fiber PU leather, while the red options are more classic in design and style. Both of the watches sit close together at an angle to look stunning, while a blue LED light also highlights them in your home as well. The hand-polished natural hardwood and high-gloss mirror also add a touch of elegance to what is already a beautiful unit. The functionality of this double watch winder is also neat. It runs a Japanese Mabuchi motor to make sure it’s quiet while also coming with five program settings, lifetime technical support, and a one-year warranty. For those who travel, the dual power supply of either AC power of three C batteries will also appeal. 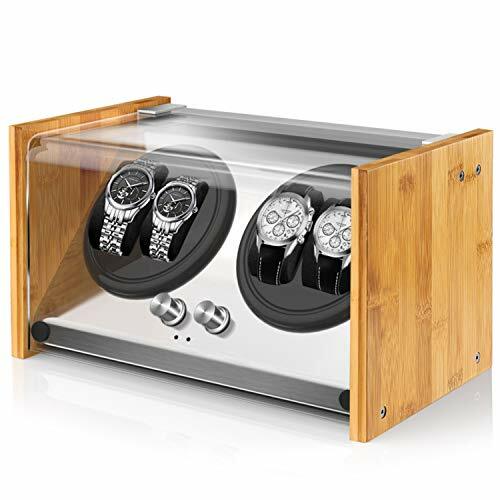 There is a lot to love about this double watch winder from Olymbros, so consider adding it to your wish list today. If you have an automatic watch collection that’s growing out of hand, then it might be time to upgrade your watch winder to something more manageable. 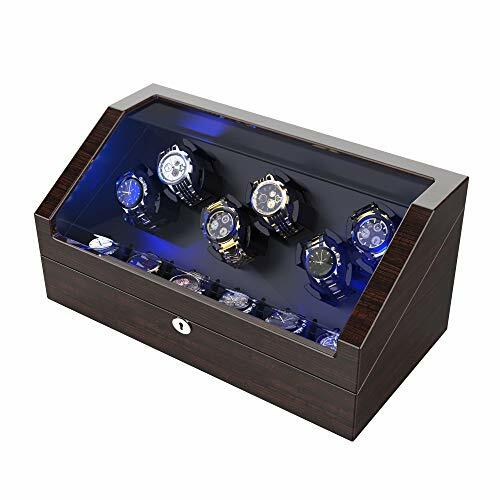 Rather than swap out your watches in a smaller winder, you can house up to eight wristwatches within this one unit to make sure you can wind them all at the same time. This watch winder station is exquisite, with so many unique benefits on offer. It comes with a built-in LCD screen, offers multiple TPD and rotation settings, and you can control each watch individually as well. What’s more, all holders are spring-loaded and suitable for most wristwatches, and it offers 18 winding programs too. The style of the winder station will be the final feature to tick all the boxes. It’s black with high-gloss piano lacquer to look stunning and stylish in any setting. If you are on the lookout for a more massive watch winder station than you already have, don’t look past this one. Watch winders are very much within a niche market, as the desire to own a watch grows smaller on a regular basis. If you are one of the few who still prefer timeless automatic watches, then you will no doubt require a watch winder to keep them in sync. The options online can vary, which means you need to do your research before jumping right into a purchase. Consider these points below to have a better chance of making the right call. 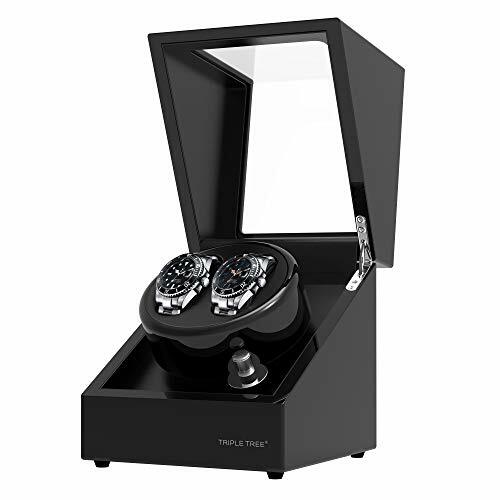 If you have two automatic watches, then buy a dual watch winder – or one with room for more than two. However, the market is more than capable of catering to your requirements. You can buy individual watch winders and even stations that hold eight. Before you go and buy a watch winder, have a count-up of how many watches you own! The settings for each watch winder can vary, but how much they change by can make all the difference. When you begin hunting around for watch winders, consider the directional settings as well as the preprogrammed settings. All of them make a difference to the accuracy of your watch. There are two main watch winder styles: contemporary and classic. The classic market is growing by the day, but the modern market is still very niche. People still prefer piano lacquer over carbon fiber sleek styling. Decide which style you like so you can narrow down your potential options a little more.